Made with fresh tomatoes and late-summer vegetables, this is a good way to use up those piles of September produce. Leave out the meat for a vegetarian version. Cook the meat: In a large skillet, brown the ground beef for a few minutes, until the meat is evenly browned. Turn off the heat and set aside. Make the sauce: Put the olive oil in a large Dutch oven. Over medium to medium-high heat, sauté the chile flakes and onion for a few minutes, then add the bell pepper and zucchini for a few more minutes. Add the garlic, then add the tomatoes and oregano. Simmer for about 15 minutes, until the tomatoes have released their juices and the sauce is watery, then add the greens, if using. Cook until the greens have wilted, then add the tomato paste and cook until the sauce thickens, about five to 10 minutes. Add the browned meat, then stir in the sugar and add salt and pepper to taste. Assemble the lasagne: Preheat the oven to 375 degrees. Put a little olive oil in the bottom of a 9-by-13-inch baking dish, then place one layer of noodles across the bottom of the dish. Start layering the sauce, mozzarella and ricotta, and remaining noodles in any order you like, so long as you finish with some sauce or cheese on top. Cook the lasagne: Bake for 30 to 50 minutes, depending upon the type of noodles, until the noodles are cooked through and the sauce is bubbling. Add the Parmesan at the very end, just as the dish is finishing cooking, so the cheese melts on contact with the hot dish. 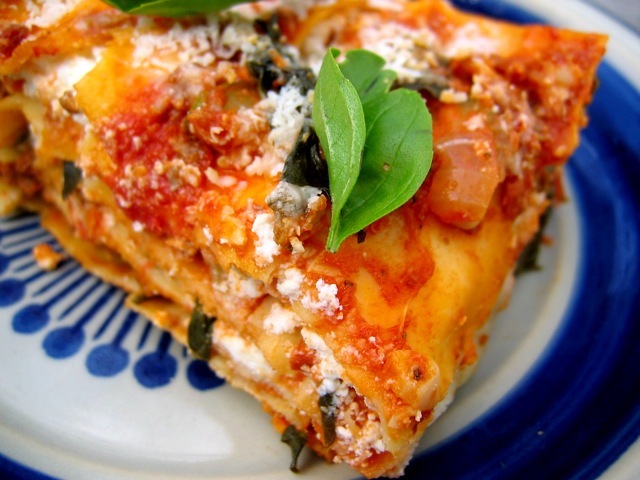 Serve the lasagne: Let cool for 10 to 15 minutes before cutting into squares. Pass the chiffonaded basil at the table, along with extra Parmesan, salt, and pepper if desired.